Last Sunday marked my ninth Mother’s Day. If there’s one thing I’ve learned it does not mean Day Off. Not that I don’t appreciate the Hallmark and florist-supported day, it’s just that expectations must be realistic. Unless you are at a remote getaway vacation slash spa trip with your girlfriends, you are probably going to have to do some of your normal tasks and chores. And children, despite their best angelic efforts, will slip back into their needy behaviors at times during your day. Here’s a recap of year nine. I’ve heard that some moms are pampered over the full weekend. Guessing that is not the norm. I work pretty diligently on Saturday – laundry, cooking, cleaning, etc – to make sure Sunday starts off on the highest note possible. This year I did four loads of laundry, shopped with my daughter, Ava, to pick up dessert recipe ingredients and made my fave spinach quiche ahead of time on Saturday = clean kitchen Sunday and an easy brunch. Did not sleep well the night prior – – up watching a romantic comedy til 1:00a.m. A few emotions and allergy triggers later, I awoke feeling low-energy and puffy. I hollered downstairs in usual form to my weekend morning tv-obsessed kids, “Church this morning! Come up in 10! I mean it!” Ava, my nine year-old, oft the most challenging to drag away, bounded upstairs and hopped into the shower. No sign of my seven year-old, Calvin. When he did surface, the little negotiator launched into the boringness of church and how he’d get much more out of religion if we could just stay home and read the bible for an hour. Just Ava and I went to mass. Home from church and the quiche is due out in five. At the table, everyone acknowledged the day and post-brunch I opened a framed photo of the family at my brother’s wedding, a red satin lipstick case and a babushka doll tea-strainer. Great. Thanks all. Now I can make my loose-leaf tea. And since we’re in the kitchen loading up the dishwater with brunch dishes, let’s just roll right into cupcake-making. This was a fairly time-consuming recipe to make and instead of the 12 cupcakes it said it would yield, we ended up with 26 cupcakes on our hands. The frosting also made way too much in my opinion, but then again, we just spread it on conservatively because we don’t have a fancy swirl-twister frosting-tipped dispenser or whatever its called. 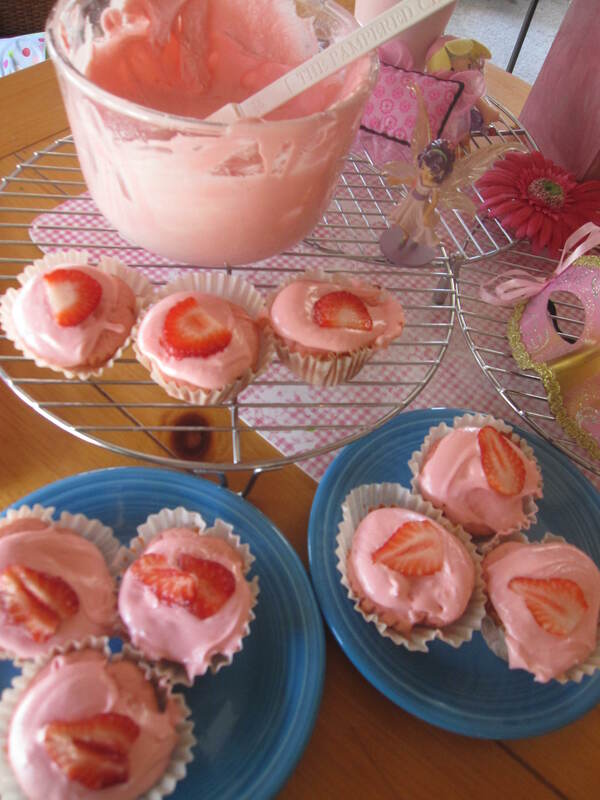 Come to find out, the drive to make cupcakes came from her American Girl magazine, which cleverly showed the best way to eat a cupcake – – cut it horizontally across its mid-section and place the bottom portion on top of the frosting so essentially you have a frosting filled cupcake. Had I known this, we might have split the cupcakes first, then frosted their middles so the ends wouldn’t be as crumbly. Next time! The kids went outside to play, my husband ran some errands, and I fell blissfully asleep on the sofa in the sunshine, listening to the kids’ laughter from their outdoor escapades. For this, I was thankful. Calvin and I planted four plants I picked up from our school’s plant sale the day prior (one of which passed already on Tuesday in the 97 degree heat). I made a kid-friendly dinner (= microwave laziness!) around 5:30, then headed out at 7:30 to meet a co-worker, who’s also a mom, at a coffee shop. We agreed that it was a fairly good day and that getting a jumpstart on work for the week would allow us to sleep better that night. I came home by 10:30, did the usual straightening and kitchen tidy-up, kissed the sleeping children on their cheeks, checked my inbox, unplugged and rolled into bed. A stellar day. One to be very thankful for. — Happy Belated Mother’s Day! (delayed post due to normal duties post-Sunday May 12).